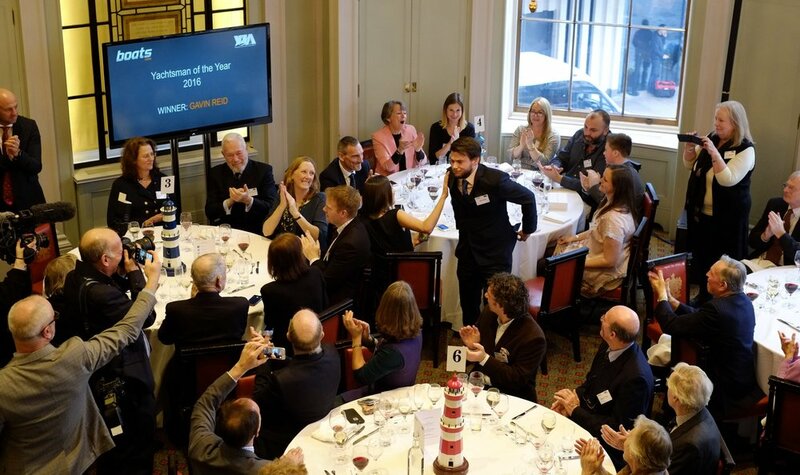 Gavin Reid receives his well-deserved award at Trinity House, London. The event is sponsored by Boats.com. A competitor in the Clipper Round the World Race 2016, he was an amateur crew member on the yacht Mission Performance. He swam out to a stricken vessel which had encountered problems returning from the Sydney to Hobart Race 2016. One of their crew had become entangled in the rigging and was stuck up the mast and they were unable to get him down. Once onboard Gavin climbed the mast to untangle him and safely lowered him down to the deck. Gavin Reid - Yachtsman of the Year 2017 with his girlfriend Katherine Law, who filmed the rescue. They met on the race. Gavin with his name engraved on the trophy alongside Sir Francis Chichester, Sir Ben Ainslie, Dame Ellen MacArthur, Sir Robin Knox Johnston, Sir Chay Blyth, Sir Edward Heath and David Cowper amongst other notable yachtsmen. Despite the yachting media pressure Gavin remained calm. Yachting blazers were the dress of the day. Some journalism is proving hard to give away, once you had to queue to pay to get your copy.